One bear, different designs. Below, left to right: (1.) One of Series 12's secret bearbricks is this bat-bear in black from Japanese fashion brand Roen (2.) A blue green surrealistic bear from the 2007 San Diego Comic Convention, by New York Pop Artist Ron English (3.) Pink bearbrick by David Flores for Los Angeles streetwear store, X-Large (4.) Bear in shades of blue with the symbol of singer/songwriter/actress Hamasaki Ayumi to promote the 2003 A-Nation concert tour in Japan. One babe, multiple looks. (Above, left to right) Dutch supermodel Kim Noorda looks (1.) understated in Bottega Veneta, (2.) glamorous in Christian Dior, (3.) trendy in Emilio Pucci, and (4.) corporate in Moschino. Because of Kim's classic, soft features, her face is the ultimate canvas for any make-up artist. Her brows can be darkened to convey strength, her lips can be thickened to look more sensual, her eyes can be outlined for that edgy goth look, etc. That's why fashion designers love her. Just last spring 2008, she walked the runway for more than 50 different brands. From Diesel Jeans to Louis Vuitton. From pret-a-porter to haute couture. 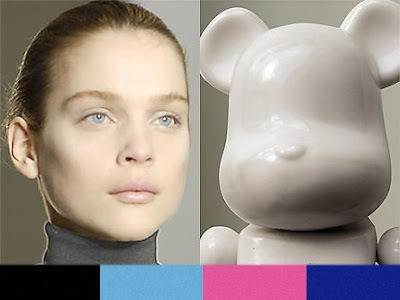 Just like a Be@rbrick, she's the consummate chameleon. 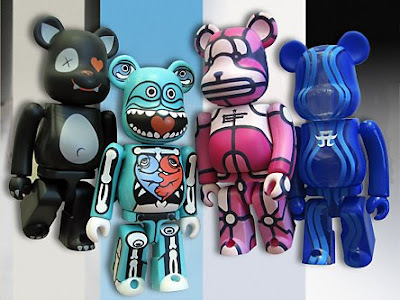 hey thanx for the link up in your sidebar column thing in "bearbrick links". Keep up the good work, I always enjoyed your bloggings! You're welcome and thanks, too, bbx! Which one is your link? oh my site is 4x3.com!